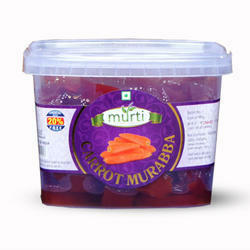 We have all varieties of murabba made from fresh fruits and vegetables in syrup. Our items include Amla Murabba, Apple murabba, Carrot murabba, Harar murabba, Bill murabba, Mango murabba, Papaya murabba, Karonda murabba (cherry), ginger murabba, etc. Packing is in 1 Kg, 18 Kg and 100 Kg tin packing. Special Note: We do customized contract manufacturing and job work. 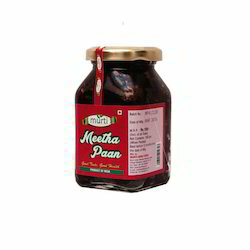 Awesome blend of paan with sweetness of roses and other secret ingredients to give you perfect taste of paan on the tongue. 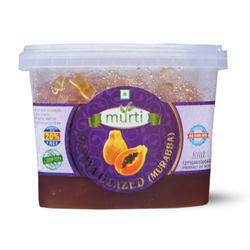 We have all varieties of murabba made from fresh fruits and vegetables in syrup. 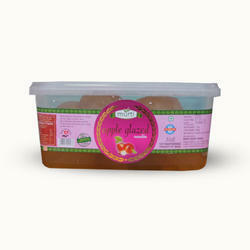 Apple (seb) murabba is very good source of multi vitamins and fibers and is naturally preserved in sugar. Packing is in 1 Kg. Special Note We do customized contract manufacturing and job work. 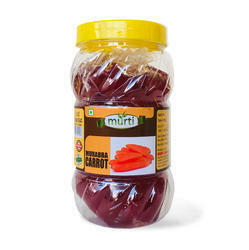 We are the leading entity in the industry, highly engaged in offering the best quality range of Murti Carrot Murabba to our clients.it is a tasty and healthy and many nutritions. it is good source of beta-carotene, vitamin k, potassium and antioxidants.they are weigt loss friendly food have been linked lower a cholestrol leval and good for eye health. Packing is in 1 Kg and 18 Kg tin packing. Amla murabbais known to work as coolant for the body and strengthens the heart. Studies suggest that it is highly effective in combating stomach disorders. Our organization provides the best flavored amla murabba, which is made from natural sugars, without compromising with its quality or taste. We recommend this murabba for those, who suffer from stomachache, hyper acidity, constipation or headache. 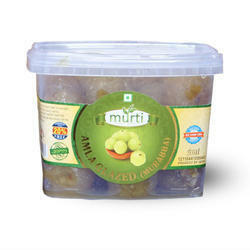 Owing to our in-depth industry experience and precise knowledge of this domain, we are providing an outstanding assortment of Murti Amla Glazed Premium Murabba to our clients. the amla for very help ful a over daily life . 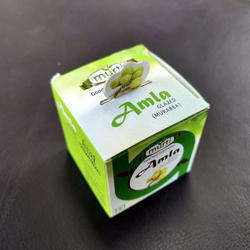 the amla s ful of nutritions and good for health. the are reduce a cancer. and control diabties, and help for a hair and eye . 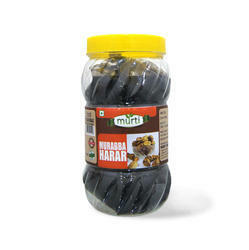 Owing to our in-depth industry experience and precise knowledge of this domain, we are providing an outstanding assortment of Murti Papaya Murabba to our clients.papya is good digestion food papaya are help for weight loss, boost our immunity, the papaya is good for our eyes and dibites, papya is healthy food . Owing to our in-depth industry experience and precise knowledge of this domain, we are providing an outstanding assortment of Murti Lokie Murabba to our clients. 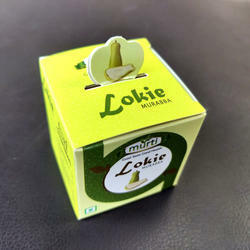 lokie murabba is best of health. the lokie is full of nutrtions like fiber , iron and 96% water , and full of protien . 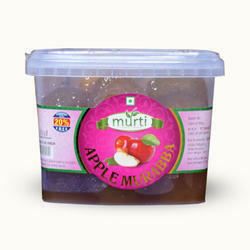 Murti Apple Murabba: We have all varieties of murabba made from fresh fruits and vegetables in syrup. 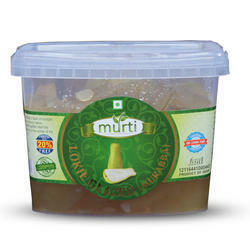 Apple (seb) murabba is very good source of multi vitamins and fibers and is naturally preserved in sugar. 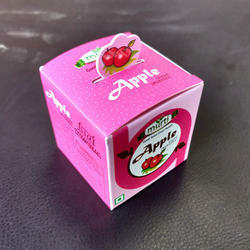 Every single piece of apple murabba is wrappws and saled in bag and then covered with nice looking small box. 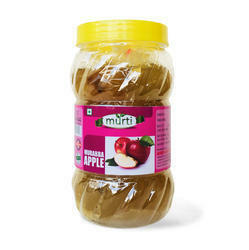 We have all varieties of murabba made from fresh fruits and vegetables in syrup.Pear murabba is very good source of multi vitamins and fibers and is naturally preserved in sugar. Packing is in 600gramsour clients.the pear reduced risk of breast cancer heart and 2 types diabities. pear are contain vitamin c, k, b2, b3 and b6.so eating pearsis good for your immune system and may help prevent cancer. 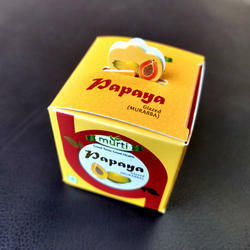 We have all varieties of murabba made from fresh fruits and vegetables in syrup.Papaya murabba is very good source of multi vitamins and fibers and is naturally preserved in sugar.Papaya are excellent source of vitamin C, and one single food provide percent of recommended daily intake.one medmium papaya apporo grams 120 calories.30 grams rbohydrate including grams fiber and 18 grams sugar . the papya is help[ for weight loss. th papya are protect aginst arthiritis. Murti bael Murabba is one of the best medicine for stomach problems. Bael (shiv fal, bill) murabba is processed preserving the maximum amount of nutrition. It heps recovering heat strokes and is a shure shot remidy to bad stomach. 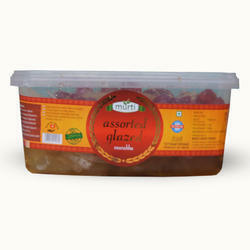 We are a unique entity in the industry, actively committed towards providing a qualitative range of Murti Assorted Murabba Glazed to our patrons. 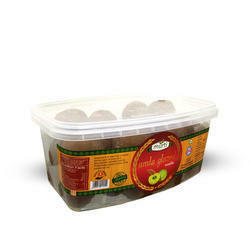 We are the leading entity in the industry, highly engaged in offering the best quality range of Murti Amla Murabba to our clients.the amla are benifit for our health like. reduse cancer, fight against heart diesase,and its help for a hair growth. 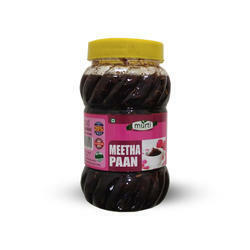 We are the leading entity in the industry, highly engaged in offering the best quality range of Murti Meetha paan Murabba to our clients. it gives good taste , helps increase your digestion and also can be used as mouth freshner. it is a mix of differnt ingredients to lure your taste buds keeping in mind the health benefits as well. 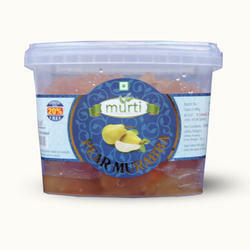 We have all varieties of murabba made from fresh fruits and vegetables in syrup. Carrot is naturally preserved in sugar. 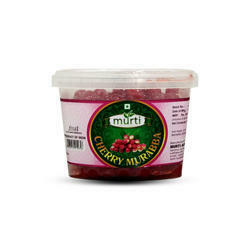 Owing to our in-depth industry experience and precise knowledge of this domain, we are providing an outstanding assortment of Murti Pear Murabba to our clients.the pear reduced risk of breast cancer heart and 2 types diabities. 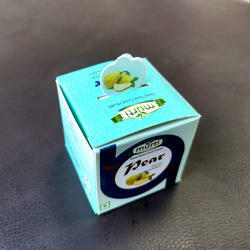 pear are contain vitamin c, k, b2, b3 and b6.so eating pearsis good for your immune system and may help prevent cancer.